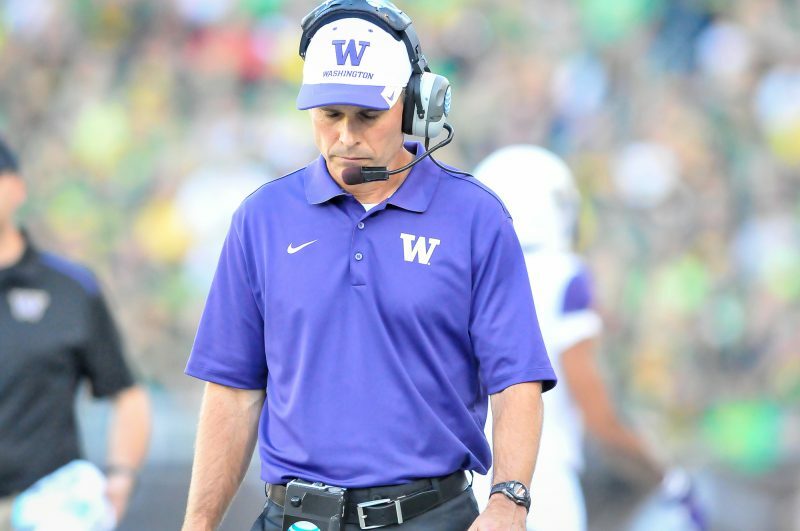 Every Husky loss, should result in pure joy. 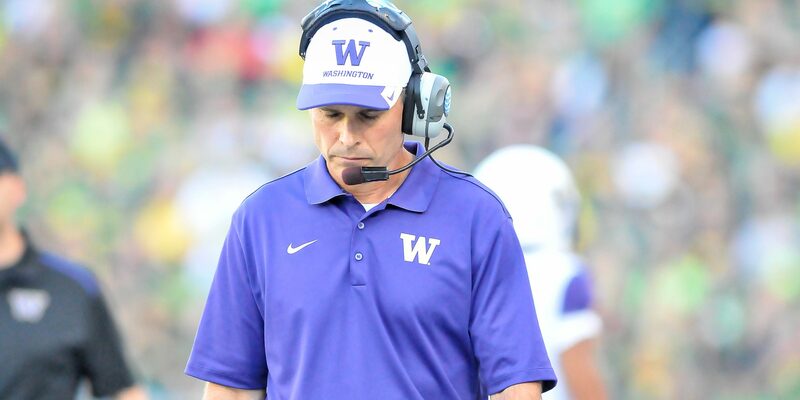 But I found myself oddly disappointed when Washington lost to Stanford on Friday. Barring something crazy (and with two of the top-3 teams losing this weekend, don’t count anything out), that game eliminated the Pac-12 from playoff contention. That’s a problem because the Pac-12 has the most parity of any conference and might be the deepest conference as well. Failing to include a representative from the Pac-12 undermines the College Football Playoff (CFP) and punishes the Pac-12 for being competitive. Under the current playoff scheme, internally-competitive conferences will always run the risk of missing the playoff. Besides that, the four-team playoff model will always be influenced by East Coast bias. As currently constituted, the playoff fails to fully realize the promise of “settling it on the field.” The best solution is to expand the playoff to eight teams. In my opinion, the East Coast stretches to the Mississippi River. After all, the midpoint of the country is Kansas, and the Eastern time zone includes most of Indiana. This matters because many folks in the east don’t watch Pac-12 games. Why? Because many of those games are past their bedtime. By way of example, this lack of attention by eastern viewers has manifested in two specific ways in the past few years. Christian McCaffrey proved it on the field, but only after the voters had gone to bed. First, Christian McCaffrey should have won the Heisman in 2015. Anyone who watched him play that year knew it. But, as the linked article points out, many people in the Eastern time zone simply weren’t exposed to his brilliance because they were sleeping instead. Second, the Big Ten was overrated last year and then got demolished in the post-season. The SEC is overrated nearly every year. But in 2016, the pundits were worse than usual with overvaluing the Big Ten. In the final CFP rankings, four Big Ten teams were ranked in the Top 10. Three of them lost their bowl games (the one winner was Wisconsin, who drew overmatched Western Michigan). Overall, the Big Ten went an abysmal 3-7 in bowl games. Why care about conference rankings? When a particular conference is under or overrated, that inaccuracy gets factored into the CFP rankings. The baseline opinions of conferences form the underlying basis for the statistical measures used by the CFP committee to reach its rankings. That means that if pundits have, for instance, an inflated opinion of the SEC, that will make it more likely that an SEC team is included in the playoff, not only because of implicit bias, but also because that bias inflates the SEC’s strength of schedule and other statistical measures. But if the pundits are wrong about how good the SEC is, the CFP rankings will be skewed. Over the long term, these biases are formed by non-conference wins, especially during bowl season. That’s why Oregon fans must become Pac-12 fans (and yes, even Husky fans) when Pac-12 teams are playing out of conference. Every year, it seems the CFP committee gets one playoff team wrong. In the first playoff (2014), the committee included Ohio State over very good TCU and Baylor teams. While Ohio State was a wise choice, Florida State looked overmatched (something that was not surprising given their weak resume and their performance in individual games). Had the committee included the top-8 teams instead, TCU and Baylor would have been included, along with Dak Prescott‘s Mississippi State and a very good Michigan State team (who only lost to champion and runner-up Ohio State and Oregon, and who eventually beat Baylor in the Cotton Bowl). 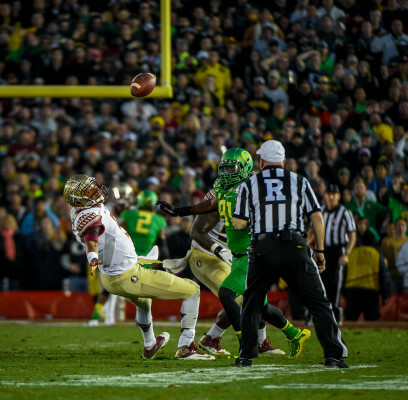 Given the weak ACC and Florida State’s uninspiring season, the result of the 2015 Rose Bowl was unsurprising. The next year (2015), the committee included Michigan State, who got skunked by Alabama 38-0, and Oklahoma, who got embarrassed by Clemson 37-17. Based on their records, their inclusion seemed reasonable, but had the playoff been eight teams, Iowa, Stanford, Ohio State and Notre Dame would have had an opportunity to prove themselves (and we would have gotten an Alabama-Ohio State rematch). 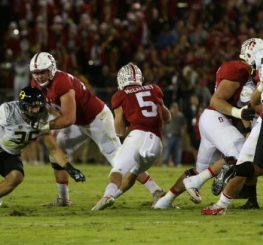 Based on hindsight from the results of the subsequent games (Stanford beat Iowa and Ohio State beat Notre Dame), Stanford would have played in the semi-finals, if not the Championship. In its most recent iteration (2016), the committee goofed again by controversially including an obviously shaky Ohio State team (who got destroyed 31-0 by Clemson) over Penn State. With an eight-team playoff, Penn State would have been included, but also Michigan, Oklahoma and Wisconsin. Oklahoma was on fire during the latter part of 2016 and could have made a run in the playoff. Some folks respond to the idea of an eight-team playoff by pointing out that we’ll be having the same arguments about who should be left out of the playoff as we are now. While it’s true that fans and pundits will always debate rankings, expanding the playoff would eliminate the worst mistakes. In 2015, Nate Silver did an analysis of what would happen if the playoff was expanded in several possible ways. Under a simple eight-team playoff, one-loss, major-conference non-champions would make the playoff 97% of the time (versus only 47% of the time with a four-team playoff). If you expand to an eight-team playoff, but automatically include major-conference champions, one-loss, major-conference non-champions make the playoff only 69% of the time, but that may be a fair price for rewarding conference parity. 2017 Rose Bowl hanging in the balance. One scenario an eight-team playoff fails to solve is USC in 2016. 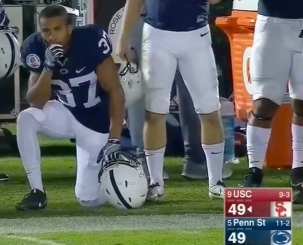 The three-loss USC ended up beating a very good Penn State team in the Rose Bowl. Ninth-ranked USC would have missed the playoff anyway, but consider this: if the playoff had been eight teams from the beginning, it’s possible that the skewed opinions of the Big Ten would have never happened that year. As a result, one of the four Big Ten teams ranked ahead of USC would have missed the playoff in favor of a USC team who had won eight straight games heading into the postseason. Still, we should recognize that failing to include the 2016 USC Trojans in an eight-team playoff, is far less problematic than failing to include the 2014 TCU Horned Frogs in the four-team playoff (who, by the way, obliterated SEC darling Ole Miss 42-3). Playing in competitive conferences should be the objective of college football, not a handicap. That’s why I believe an eight-team playoff with automatic bids for major-conference champions is the ideal playoff scheme. Not all conferences are created equal, even among the major conferences. The Pac-12 shouldn’t be punished for being competitive top to bottom (or for the early bedtimes of easterners). And I shouldn’t ever have to shed a tear when the Huskies lose.